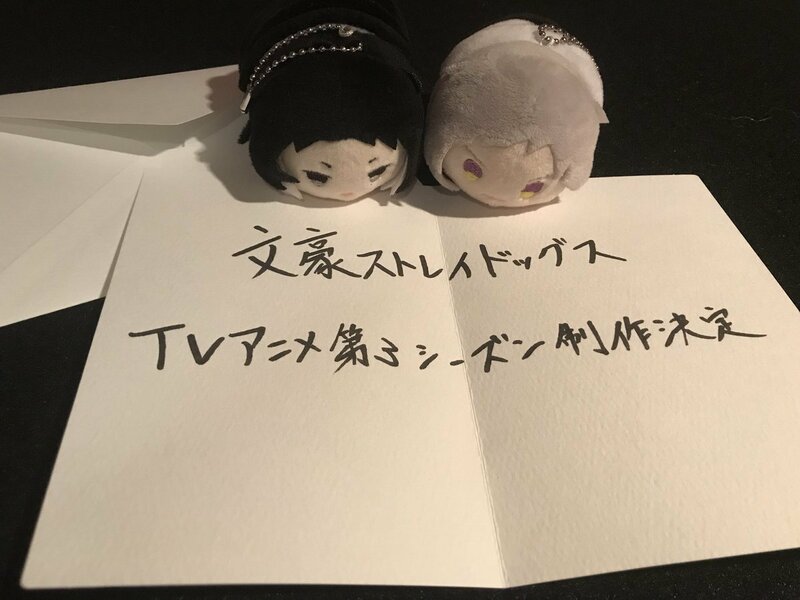 A screening event of the Bungou Stray Dog: Dead Apple anime film at the Marunouchi Piccadilly theater in Tokyo on Saturday announced that a third season of the franchise is in production. More information regarding the new season will be revealed at a later time. Bungou Stray Dogs adapts Kafka Asagiri and Harukawa35's supernatural action manga of the same title, which has been serialized in Young Ace magazine since December 2012. Kadokawa published the 15th compiled volume on June 4. Produced by studio Bones, the first season aired in Spring 2016 and the second season followed in fall of the same year, each running for 12 episodes. An OVA was bundled with the 13th manga volume last August. The Bungou Stray Dog: Dead Apple anime film opened in Japan on March 3. Crunchyroll screened the film in United States and Canadian theaters in May. Yen Press licensed the manga in English and published the seventh volume on June 26. Crunchyroll and Funimation licensed the anime series for North American distribution and released the first season on Blu-ray and DVD with an English dub on March 6. The second season is scheduled to be released on September 4. Airing on Fridays at 22:30 (10:30 p.m.) via Tokyo MX, followed by BS11, Sun TV, KBS Kyoto, TV Aichi, WOWOW, and tvk starting April 12. dAnime Store will also stream the anime. Vol.1 info. (eps. 26-28 & cover image). I´ve sent the official poster to gallery, I hope moderators accept it. GRANRODEO and Luck Life again. Yes. I'm too excited for more Fyodor. This is honestly one of the biggest surprises I've heard this year so far. Never thought I'd hear this show get another season but I welcome it. Yeees! BTW. These puppet is very kawaiii! IKR? They are called mochi mochi mascot. I want one. I needed more bungo. Yes! YES! Loved the first 2 seasons. I can honestly say I wasn't expecting this. Looking forward to it.